Historic and previously unseen footage shot by the late musician and filmmaker Eddie Kamae for his “Listen to the Forest” documentary is now online through the efforts of ʻUluʻulu: The Henry Kuʻualoha Giugni Moving Image Archive of Hawaiʻi to preserve, digitize, and catalog archival footage from the making of 10 award-winning documentaries by Kamae and his wife, producer Myrna Kamae. 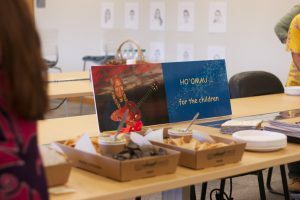 “(Noted Hawaiian Scholar) Mary Kawena Pukui had always told Eddie, ‘Hoʻomau, Eddie, Hoʻomau’ — continue on and do it for the children — so having this resource and making it available fulfills Eddie’s dream and the vision we have had for this work,” said Myrna Kamae during an event commemorating the archival material’s digitization and preservation. 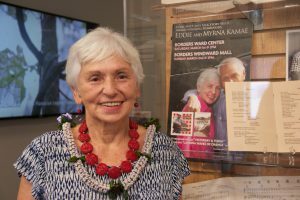 She said ʻUluʻulu, housed on the UH West Oʻahu campus, is a critically important resource for the state and praised Heather Giugni who had the vision for the archive and serves as its Cultural Collections Specialist/Producer. Kamae said since 1986 she and Eddie had concerns about where they could preserve their work for future generations. She called ʻUluʻulu Head Archivist Janel Quirante “an incredible director. Heather has created the building blocks and continues the strengthen the work that goes on here,” said Kamae, who praised the ʻUluʻulu staff as being very competent and caring. The complete descriptive catalog of “Listen to the Forest” and short streaming video clips of newly digitized footage can be found at ​http://uluulu.hawaii.edu​ starting Aug. 4. “Listen to the Forest” is part of the Hawaiian Legacy Foundation documentary series released between 1988 and 2007. The 1991 film is about the biodiversity of Hawaiʻi’s rainforests and the unique relationship of reverence existing between the Hawaiian people and their environment. 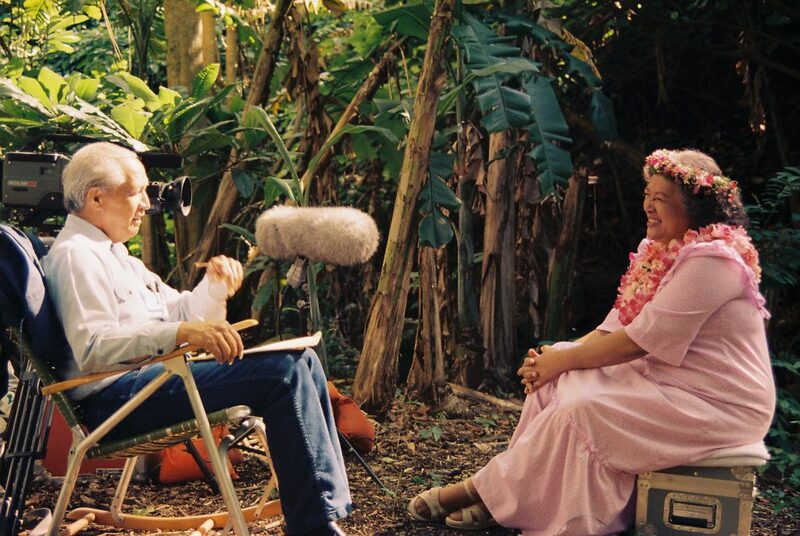 In total, more than 33 hours from 84 videotapes of raw footage from the making of “Listen to the Forest” have been digitized and preserved by ʻUluʻulu. The effort is the result of a March 2016 Preservation and Access Partnership between ʻUluʻulu and the Hawaiian Legacy Foundation to make the documentaries’ archival footage available to the public after it was preserved, cataloged and digitized. The Hawaiian Legacy Foundation was created by Kamae and his wife Myrna to help perpetuate the cultural heritage of Hawaiʻi through music, film and video, educational programs, community outreach and archival work. Work continues on preserving and digitizing the entire Hawaiian Legacy Foundation collection of nearly 1,000 videotapes housed at ‘Ulu‘ulu. Researchers registered with ‘Ulu‘ulu may view the full-length footage of interviews, traditional chants, and original songs and dances, upon request. Tagged Eddie Kamae, Hawaiian Legacy Foundation, Heather Giugni, ʻUluʻulu, Janel Quirante, Listen to the Forest, Mary Kawena Pukui, Myrna Kamae. Bookmark the permalink.